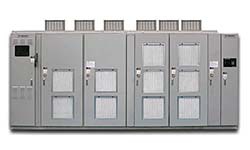 MV1000 medium-voltage AC drive has an input isolation transformer and nine-level output to cut down on harmonics without the need for additional filters. All-in-one package comes with or without input switchgear and can be used in new or retrofit applications. Advanced control features include open-loop vector control; digital operator has an LCD display and can communicate with all major industrial networks. Includes software and wizard for ease of configuration; configurations can be copied through a USB port.